How to Download YouTube to 2017 iPad Pro iOS 11? Recently, Apple has announced its new generation of iPad - iPad Pro in 11 and 12.9 inches. For movie goers, perhaps the most exciting part of the new iPad is the all-screen design, making the watch of videos on the bezelless display a pure delight and immersive experience. Plus, the new liquid Retina display goes from edge to edge, creating a paper-like screen effect while you enjoying videos. No wonder YouTubers brook no delay to watching videos thereon. To save you from constant buffering, annoying ads, unstable internet connection, and Wi-Fi unavailable awkwardness, you are going to be informed of how to download YouTube to iPad Pro for offline viewing. This page will share you several practical methods to watch YouTube offline on iPad Pro. The best way to download YouTube videos to iPad Pro is using MacX Video Converter Pro, which delivers an astounding YouTube downloading and converting performance on your Mac/PC. It allows you to save videos from YouTube to iPad Pro for offline watching without restriction. What's more, it provides a super fast & stable solution to grab 4K 2160p videos, HD clips (720p/1080p) and 3D footages from YouTube and convert them to MP4, MOV, etc. for playback on your iPad Pro without ads or loadings. Especially, you can download a music video from YouTube to iPad Pro within 30 seconds only. 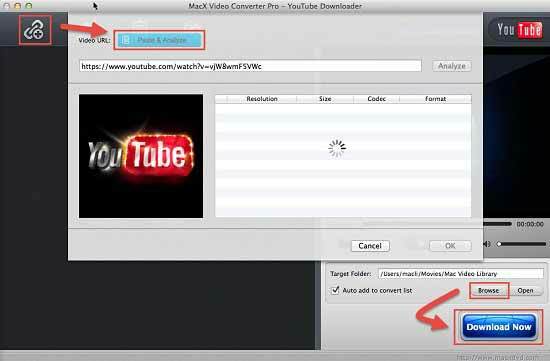 Besides the YouTube download feature, MacX Video Converter Pro also supports downloading videos from 300+ online video sites like Facebook, Dailymotion, Vevo, Vimeo, etc. and make the videos perfect for the final delivery on iPad Pro, iPhone, Android phone, Windows phone, PSP, PS4, and so on. Step 1: Download, install and launch this YouTube to iPad Pro downloader for Mac/PC. Click YouTube button, copy the URL of the video you'd like to watch offline on iPad Pro, then hit "paste & analyze". Step 2: Choose video format, resolution and file size you desire. Click "Browse" button to specify an output folder, then hit "Download Now" to initiate video downloading. The rest job will be done by this YouTube to iPad Pro downloader automatically. Step 3: Click "Apple Device". Hit "to iPad Video" and choose "iPad Pro" option. After all done, press "RUN" button. When the conversion is done you can upload the output video to your iPad Pro and enjoy it anytime and anywhere you like. Frankly, to download YouTube video to iPad Pro is not limited to MacX Video Converter Pro, there are actually other feasible solutions, such as browser extensions and YouTube app. 4. Double click on it and it should download the YouTube video within a few minutes. 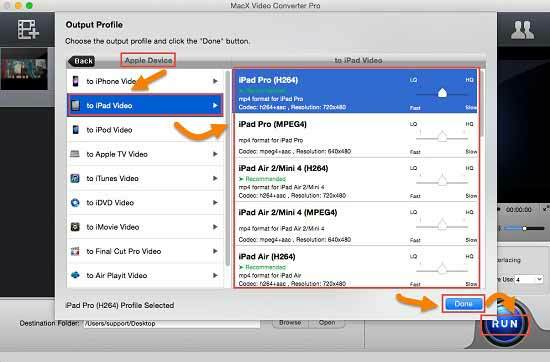 Tips: Videos in MP4 and MOV are highly recommended because they can be directly played by QuickTime player which is the default video/audio player of iPad Pro. Moreover, to download HD videos from YouTube is a better choice for they are perfectly fit for your 12.9-inch HD display. There are many helpful online video download tools. The most well-known web services are Keepvid and Clipconverter, both of which work well with YouTube, MySpace, Dailymotion, Vimeo and other mainstream online video hosting sites. With them, you can download HD videos from YouTube to iPad Pro easily. Having trouble playing 4K UHD on iPad Pro? Learn how to convert 4K UHD video of iPad Pro incompatible formats for 4K UHD smooth playback on iPad Pro, and download 4K UHD video movie to iPad Pro. MacX Video Converter Pro can download YouTube to iPad Pro in HD (720p, 1080p, or even 4k, 8k) with no quality loss and fast speed. It also enables you to convert any YouTube video to MP4, AVI, MOV and more for playback on Windows Media Player, iPhone, iPad, Android phones, Xbox, PS3, etc.